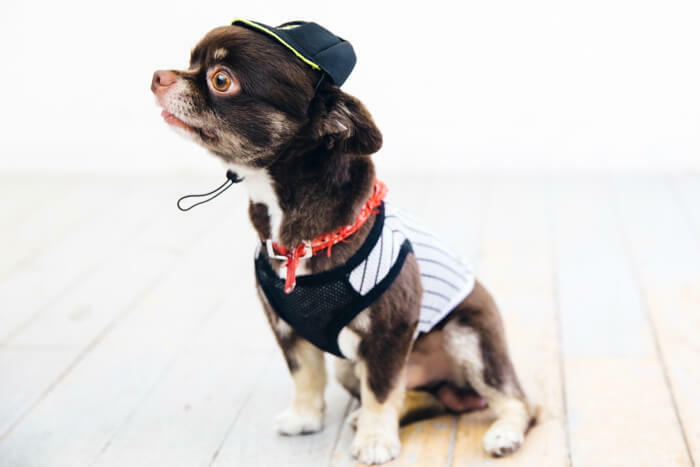 In this featured series, dog lover and model Yuna Yabe heads out with her trusty partner Mozuku to visit hot spots that people and their dogs enjoy, while deepening her bond with him. 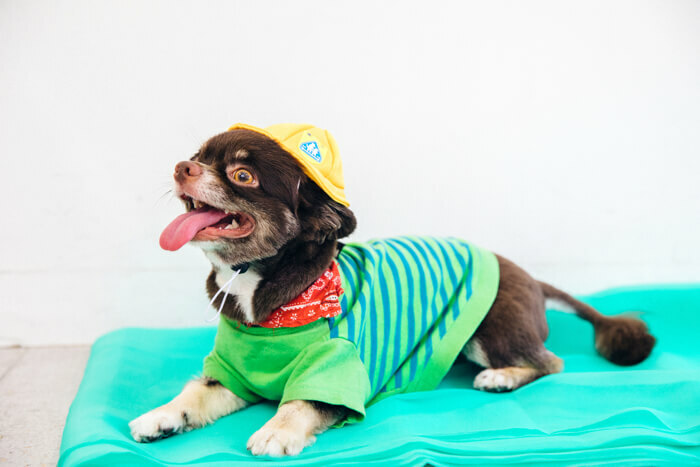 In today’s article, Yuna dresses up Mozuku with hats from a capsule toy series she likes called ‘Inu no Kaburi Mono’ (Things for Dogs to Wear). The ‘Inu no Kaburi Mono’ series Yuna is interested in is by Kitan Club. She found capsule toy items for cats that she wanted Mozuku to try on, but she also wanted to try the dog ones, so she ended up having him wear a variety of things. 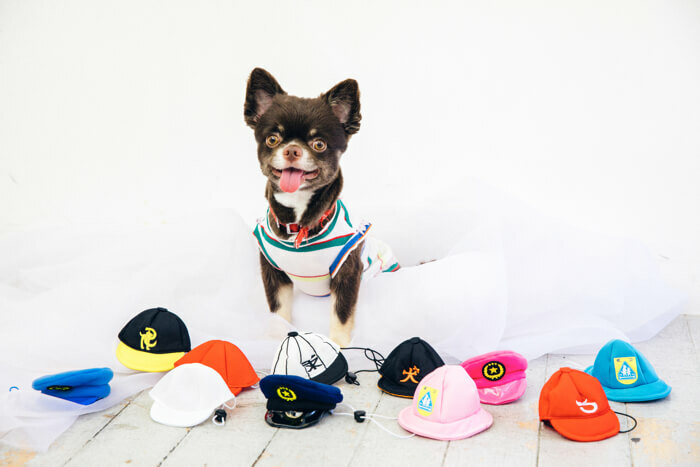 The Kitan Club hat series features 3 different designs: baseball caps, school caps and cop hats – and they all come in different colours! First up is the black baseball caps, fittingly co-ordinated with a striped Marines uniform to complete this sporty look! A perfect outfit for exercise in the park. 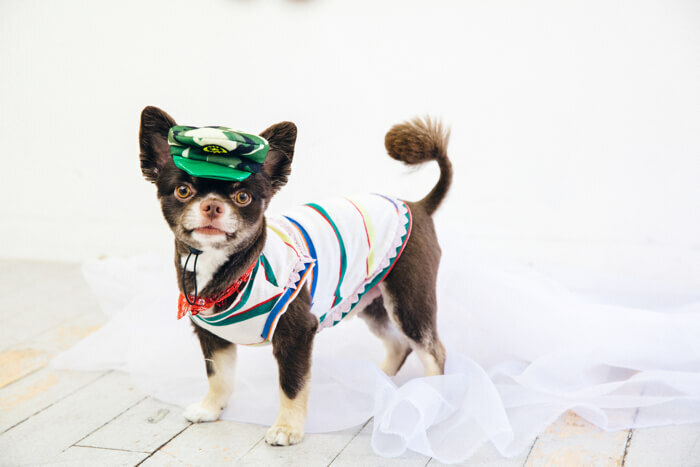 Next is the white doggy cop hat. Mozuku is looking summery with the outdoor white polo shirt too. 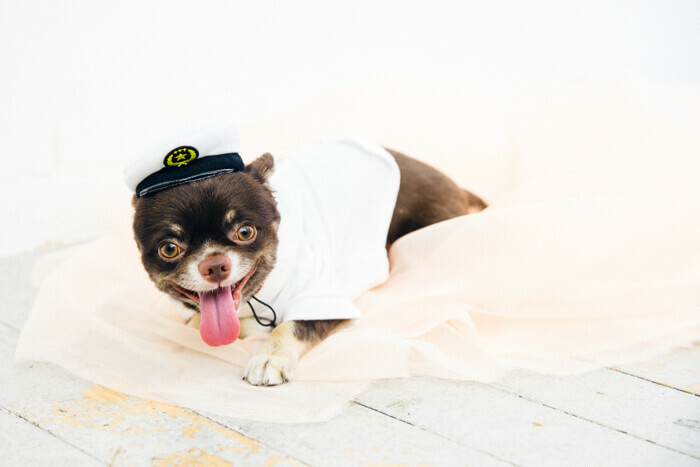 He looks like sailor! This big dropping t-shirt gives Mozuku a kid look. He has a yellow school cap on and looks just like a Japanese kindergartener. It matches perfectly with the green! The one Yuna wanted him to wear the most was the camo one. He’s wearing it together with a border-type Western outfit remade by her grandma. He looks like a fashionable and heroic guy! The last look is the red and navy co-ord. Wearing matching navy caps is a lot of fun. If you’re in Japan and come across capsule toy machines, known as gashapon, then be sure to look out for this series. They’re ¥300 each. Yuna Yabe won the grand prix prize at the “Zipper×ASOBISYSTEM Model Auditions” at the age of 15. She is an expert not only in fashion but make-up and video editing too. She’s an influential figure to the people in her generation. Recently, her work has expanded greatly, such as appearing in music videos. Her activity continues to grow and looks to be very promising indeed.